This week we showcase an IKEA kitchen design project that involved a custom corner tall cabinet. It was the kind of challenge we were delighted to work on. Many thanks to Jen, from Salt Lake City, Utah, for choosing to work with us! 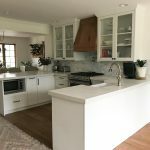 We wanted a kitchen remodeling that was beautiful but also affordable. We got quotes from local cabinets shops but everything was well over our desired budget. With IKEA’s cabinets, we not only got the look we wanted but were able to afford the extras like soft-close drawers, hidden inner drawers and glass doors. Me and my husband started the design process ourselves but found the online IKEA software slow and difficult to use. We also had no experience designing kitchens and had trouble utilizing the space we had and creating the open workable kitchen we wanted. We read online and found others giving recommendations to IKD, and decided it would be well worth the cost. The design phase went flawlessly. We gave IKD our measurements and overall concepts. We loved the design Chuck came up with. My husband and I had several custom additions so he left several things open-ended so we could add those in. The designer gave us our final IKD design just in time for us to order everything from the IKEA kitchen sale and I ordered everything to be delivered to our home. Installation, on the other hand, was longer than expected. While we were waiting for delivery, we demolished our current kitchen and got to work moving the water line for the fridge and the power for the electric wall oven. We kept the island for as long as possible so we’d still have running water and the dishwasher. The delivery went great. I was warned about the millions of boxes and was ready to organize everything. I’m a stay at home mom so I’d put together the cabinets during the day and we’d hang them together at night and on the weekends. ( what an IKEA DIY team journey). The most difficult part was working with the countertop installers contracted through IKEA. They don’t let you schedule the measurements until all the counters are fully installed. Then since we were off a foot on our payment they added another week to get that updated. Since we were in the month of December, with all the holidays it took four weeks before they came and installed the countertops. That’s a long time to go without a kitchen sink! After that, the rest came together really quickly and we’re loving our new kitchen! Definitely, a husband and wife IKEA DIY team survival lesson. We didn’t like many of the IKEA modern styles but the Bodbyn line really fits what we were looking for. We added a traditional trim for the crown molding and the IKEA trim for the undermount. Also, at first we ´re not sure if we were willing to give up the upper cabinet space near the exhaust hood. But having drawers in the lower cabinets and adding a tall cabinet around the wall oven has given us plenty of cabinet space. I also wasn’t sure about having white cabinets given we have four small children. However, the IKEA cabinet has a shiny finish that makes it really easy to wipe them clean. It really is fantastic to have a shiny white bright kitchen!. IKEA DIY team survival lesson completed. Yes! I had an idea-book, both in Pinterest and Houzz and I had read almost every post from the IKD blog. Ability to cook bacon without setting off fire alarms. AKA: Exhaust hood vented outside. I loved working with IKD. As I ran into questions (I debated putting in an appliance garage) they´re very helpful with what I’d need through the online chat. That was much more effective than the time we struggled with installation door fronts and spent an hour on hold with IKEA customer service. I also have counseled other friends to work with local installers directly instead of contracting through IKEA for the countertops. I love my quartz countertops but the delays were very frustrating. We like the subway tile and how the range hood has plenty of space around it.